The Papillon was bred in 16th century. They are considered as a dainty breed, but in reality are well balanced and lively. The Papillon is alive, joyful and stylish. They are wise and make good relations with their opponents. They don’t show as they are shy or aggressive. They are lively and active but are also calm and patient. They are gentle and affectionate and love to be cuddled. They behave very well with older considerate children. They are also possessive about their owner. If they see any problems with their family they bark at all sights and sounds. The Papillon is a lovely companion. 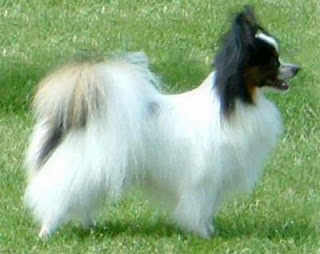 The Papillon's coat is long and flowing, and is silky in texture. They have no undercoat. Their coat will fluff at the chest area, and is fringed at their ears. The Papillons coat is white with patches of color, which include black and red. They may also be tri-colored with white body, black and tan markings. The hallmark coloring covers both eyes and ears completely and a white blaze on the forehead. The Papillon is extremely faithful and have the ability to solve problems. They require socialization mostly with cats. This dog breed loves to walk. If the area is covered with fenced that must be high enough as this breed will use their problem solving skills to escape if left unsupervised. They are not suitable for apartments as they bark too much. They should be brushed several times in a week. It is important to brush some areas behind the ears and stomach areas. It is important to keep the pads of their paws trimmed to prevent splaying. The Papillon is prone to various health issues such as cataracts, patella luxation, and Von Willebrands disease.